As America ages and we’re bombarded by the noise of modern-day living, hearing loss has become a growing public health concern. Today, it’s the third most common chronic health condition in the United States. Left unaddressed, hearing loss can have a profound effect on people’s lives—from interpersonal communication, to health and quality of life. The good news is that hearing technologies and treatments are becoming more advanced and accessible, offering help and hope for children born with hearing loss and for people who develop hearing loss later in life. Hearing loss is common. It knows no age limits. It affects the very young, the very old, and every age in between. When you break it down, about 15 percent of adults in the United States (18 and older) report some trouble hearing—roughly 37.5 million people. Men (20 to 69 years of age) are almost twice as likely as women to have hearing loss. Among younger Americans, roughly 15 percent of teens—12-to-19 year old’s—have some degree of hearing loss. And for every 1,000 children born in the United States, two to three have a detectible level of hearing loss at birth. Hearing loss can come on gradually or suddenly. And the underlying causes range from genetics, to infections, to the side-effects of certain medicines, to aging. But for the great majority of people, the biggest threat to their hearing is noise. The ability to hear is something most people take for granted, albeit unconsciously—until it’s threatened or lost in some way. When people experience hearing loss, it can significantly affect many dimensions of their lives—from personal relationships, to their work life, to their level of engagement in social situations. But when hearing loss is appropriately addressed, many people find they manage well and that their quality of life improves. In recent years, researchers have gained a greater understanding of the connection between hearing loss and other health concerns. In fact, studies show a link between hearing loss and cognitive function and dementia, depression, diabetes, cardiovascular disease, moderate chronic kidney disease, rheumatoid arthritis, obesity, sleep apnea, and an increased risk of falls. But the reason for these links and what they mean is still under study. Hearing loss, for example, is about twice as common in people with diabetes; seniors with hearing loss are significantly more likely to develop dementia over time; and impaired cardiovascular health may have a negative influence on hearing. For these reasons, it’s critically important that anyone who suspects they may have hearing loss see a hearing healthcare provider so it can be appropriately addressed. More specifically, the hearing process starts with sound waves collecting in the outer ear, passing through the ear canal, and causing the eardrum to vibrate. The bones of the middle ear then transmit these vibrations to the inner ear. The inner ear plays a crucial role in transforming these mechanical vibrations into electrical impulses, or signals, which can be recognized and decoded by the brain. When the vibrations reach the cochlea (pronounced coke-lee-a) in the inner ear, via movement of the bones in the middle ear, the fluid within the cochlea begins to move. This sets off back and forth motion of tiny hair cells (nerve endings or sensory receptors) lining the cochlea. This motion, in turn, results in the hair cells sending a signal along the auditory nerve to the brain. Along the brainstem these nerve signals from the two ears are mixed and compared at several stages. These processes help with everyday functions such as our ability to locate a sound in space. Ultimately the brain receives these impulses and interprets them for meaning in its hearing centers. The ear has three main parts: outer, middle, and inner (See Figure 1). The outer ear consists of the part of the ear you can see, in addition to the narrow, tube-like opening called the ear canal. At the end of the ear canal is a tightly stretched tympanic membrane, the eardrum, which separates the outer ear from the middle ear. The inner ear is made up of two components: one involved with hearing, the cochlea, and the other with balance, the vestibular system. The cochlea is a snail-shaped chamber filled with fluid and lined with sensory receptors in the form of tiny hair cells. It’s attached to the auditory, or hearing, nerve that leads to the brain. The vestibular system is made up of a network of tubes (semicircular canals) and sacs (vestibule). When you look at the mechanics of how we hear, there are three common categories of hearing loss: sensorineural, conductive, and mixed. Most hearing loss is sensorineural hearing loss and involves either the loss of inner ear hair cells or fibers of the auditory nerve. Other parts of our hearing mechanism also can be affected but this is not commonly the cause of age- or noise-related hearing loss. Without these hair cells—which vibrate in response to sound waves, sending signals along the auditory nerve to the brain—we cannot hear. Once destroyed, the body doesn’t replace either the hair cells or the nerve fibers. To date, there are no medical treatments to reverse most sensorineural hearing loss, and it’s typically considered a permanent condition. For people with sensorineural hearing loss, sounds tend to be muted or distorted, making it difficult to hear spoken language clearly—especially in noise. Conductive hearing loss involves a physical problem with the functioning mechanics of the outer or middle ear. 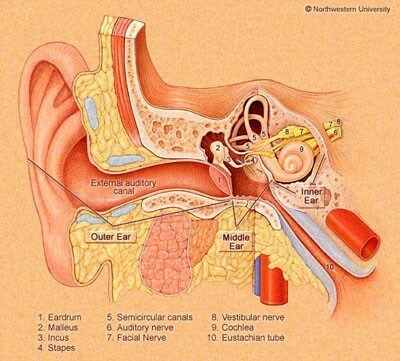 Basically, something is impeding sound from moving from the outer to middle or inner ear. This can be as simple as a build-up of ear wax. Or it can be a physical object—such as a tiny bead or pieces of cotton swabs—stuck in the ear canal. It also can result from fluid in the middle ear, a hole in the eardrum, birth defects, a condition known as otosclerosis, or a cholesteatoma—a noncancerous skin growth behind the eardrum—among other things. More often than not, the cause of conductive hearing loss can be identified and treated to partially or completely improve hearing. Mixed hearing loss simply means the individual has a combination of both sensorineural and conductive hearing loss. When someone is diagnosed with hearing loss, it can mean many things. In fact, degrees of hearing loss range from mild to moderate to severe to profound. Typically, people with mild hearing loss only notice difficulty hearing in specific circumstances—like following conversation in a noisy environment. They’re usually able to hear sounds above 40 decibels. People with moderate hearing loss have a more difficult time and may find themselves asking people to repeat themselves, especially when on the phone. Following group conversations may be difficult, as well. People with moderate hearing loss typically are able to hear sounds above 70 decibels. People with severe hearing loss usually need to rely on lipreading or the use of a hearing aid or other assistive listening device to follow the conversation. They typically can hear sounds above 90 decibels. Profound hearing loss means that someone can’t hear what another person is saying unless it’s extremely loud. Understanding the conversation usually requires a hearing aid or cochlear implant. Some people with profound hearing loss prefer to use sign language to communicate. People with profound hearing loss typically can’t hear sounds lower than 91 decibels. We invite you to visit our web pages “Common Ear and Hearing Issues” and “Living with Hearing Loss” for additional information.